As well as our bar menu, which features a variety of styles, we also have daily special boards, a selection of homemade puddings, and from Monday to Friday lunchtimes, our senior guests have their own special board and can enjoy a two course meal at a reduced price. 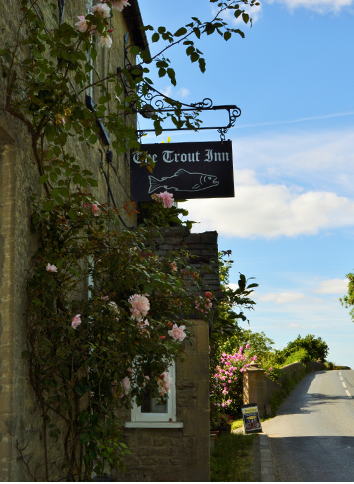 During the colder months we offer a home cooked Sunday roast dinner, with locally sourced meat and vegetables. Booking is advisable, especially for larger groups. We are allergey aware and comply with EU allergy regulations. If you wish to know the ingredients of any of our dishes, please ask when ordering. our allergay data has been derived from our own recipes and our suppliers specification sheets. However nuts, fish, eggs, shellfish, milk, sulphites and gluten products are used in our kitchen and it is impossible to fully guarantee the separation of these items. We pride ourselves on the fact that all our food is cooked to order, and as such we would like to point out that we are not a "fast food" pub. During busy periods there will be a wait for food and our staff should be able to advise you of the approximate delay. Please ask if you are in a hurry and we will try to speed up your order, but cannot promise. If the weather is warm, why not relax in the garden and watch the world and the river Thames go by while we cook for you. If you wish to reserve a table, please call us, but please be aware that all we are doing is ensuring that you have a table. You will have to order your food and drinks at the bar or any other food ordering point set up on the day. We are unable to place your order at the front of the queue. We will have a smptous menu for you on this special evening. (H) Denotes a healthier option, (V) Denotes vegetarian option. We are allergy aware and comply with the latest E.U.regulations. If you wish to know the ingredients of any of our food or beverages, please ask a trained member of staff. 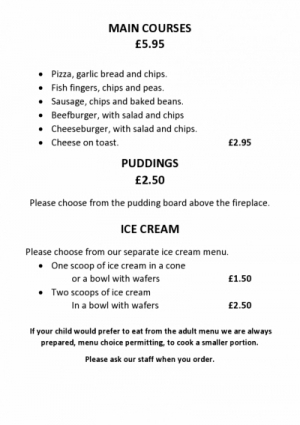 We have a separate children’s menu available, but will cater for your child with a smaller portion from this menu if required.